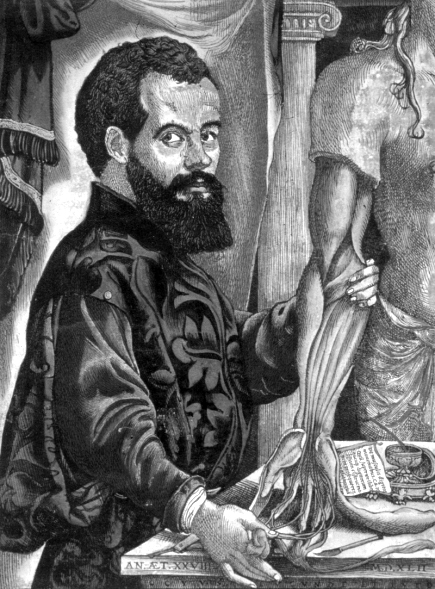 Andreas Vesalius, one of the greatest physicians and educators of the sixteenth century, was born in Brussels five hundred years ago today on the 31st of December 1514. To celebrate this special day I thought I would tell the story of Vesalius and the myth of Apollo and Marsyas as it brings together the history of medicine, the history of art, mythology and some memorable images. Vesalius studied Medicine at the University of Paris and then the University of Padua where he obtained his doctorate in 1537. He was then appointed professor of anatomy and taught there until 1543 before becoming court physician to the Emperor Charles V and subsequently his son Phillip II. He died at the early age of 50 on the Greek Island of Zakynthos. 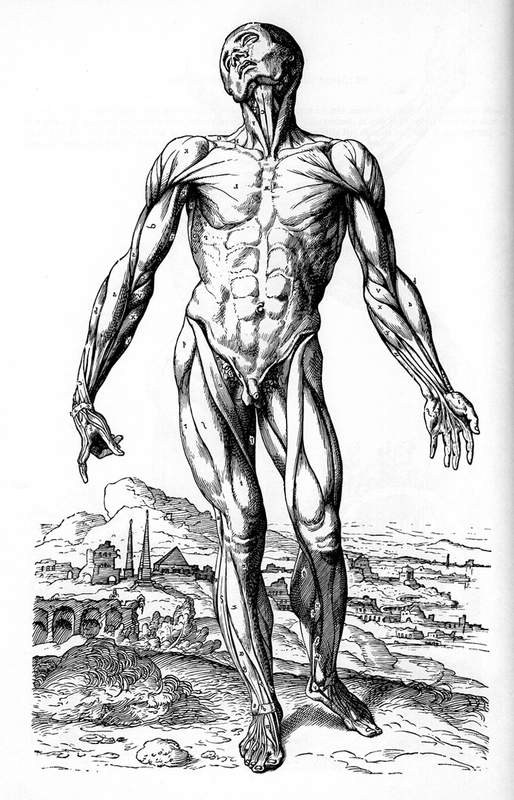 In 1538 Vesalius published his first anatomical text, six printed sheets entitled Tabulae Anatomicae. It was in 1543 however, at the young age of 29, that he published his greatest work, a book that Sir William Osler described as one of the most important in the history of medicine. De Humani Corporis Fabrica Libri Septem, on the structure of the human body in seven books, is a massive work of 663 pages and marks the turning point from medieval to modern anatomy. 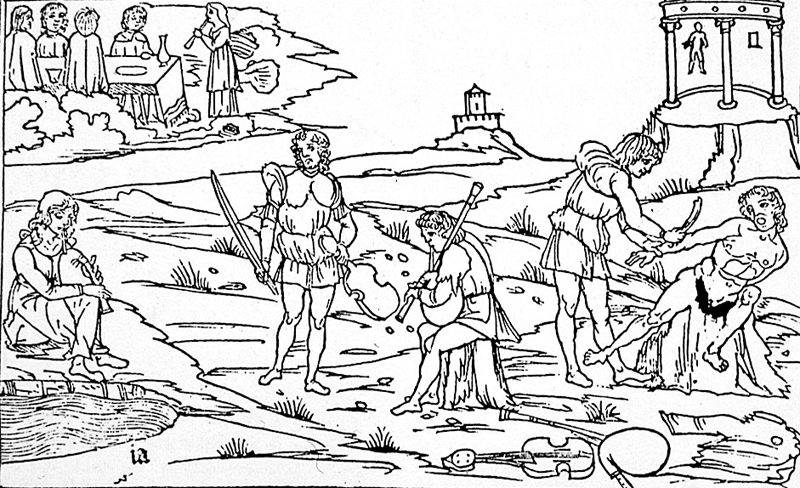 The frontispiece of the book is considered one of the great woodcuts of the 16th century. Vesalius is seen standing at the dissecting table in this stylized Teatro Anatomico in Padua teaching a crowd of students and dignitaries. This was quite unlike any professor of Anatomy from the previous two centuries who would always sit in the professorial chair reading from the works of Galen high above the dissecting table below, where a barber surgeon would be dissecting the body part under discussion. 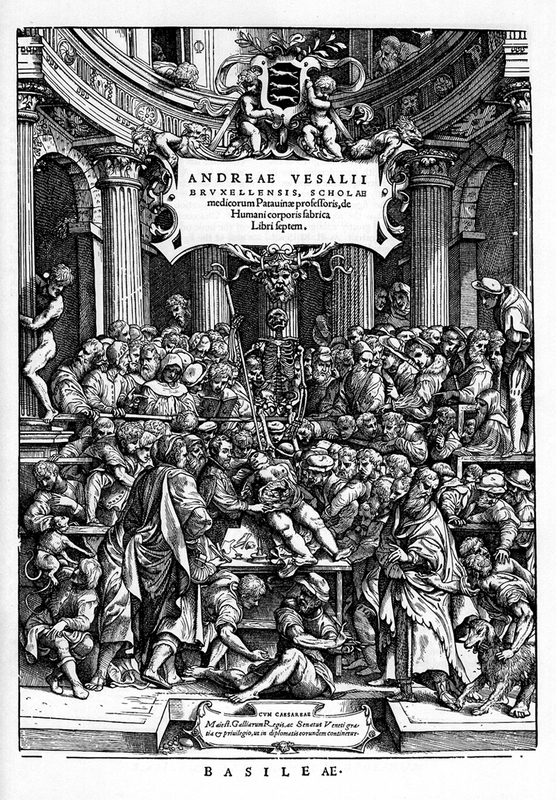 The book contains some of the first anatomical descriptions and illustrations of human anatomy to be published, descriptions however that were considered controversial, for Vesalius had dared to challenge the authority of Galen whose anatomy, which was based on animal rather than human studies, had prevailed for nearly 1500 years. 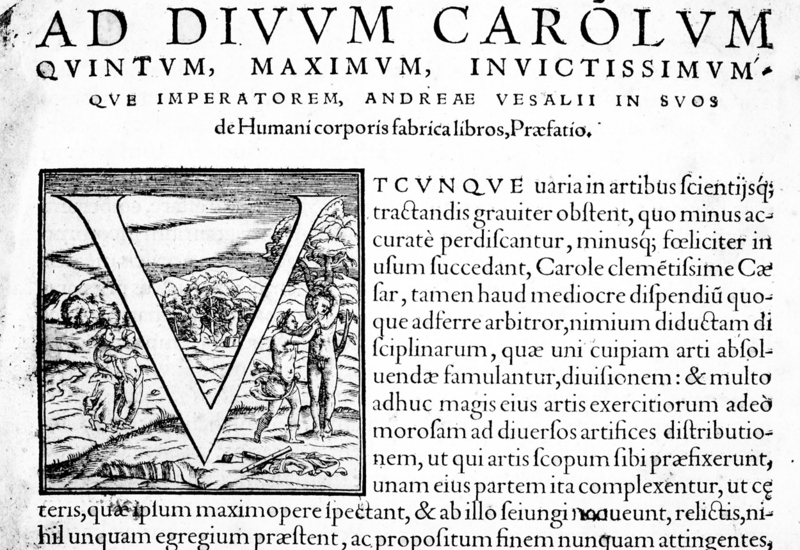 Vesalius dedicates the Fabrica to Charles the Fifth. 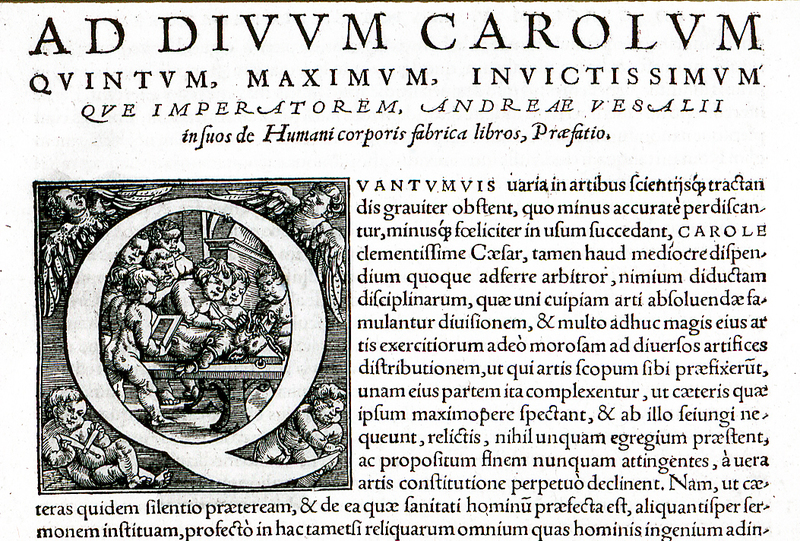 “Ad Dium Carolum Quintum” he writes on the opening page and then begins his Preface with the first of five large historiated initials, the letter Q for Quantumvis. In 1555 Vesalius published a second edition of the Fabrica containing a number of revisions, the first being a new frontispiece as shown above. 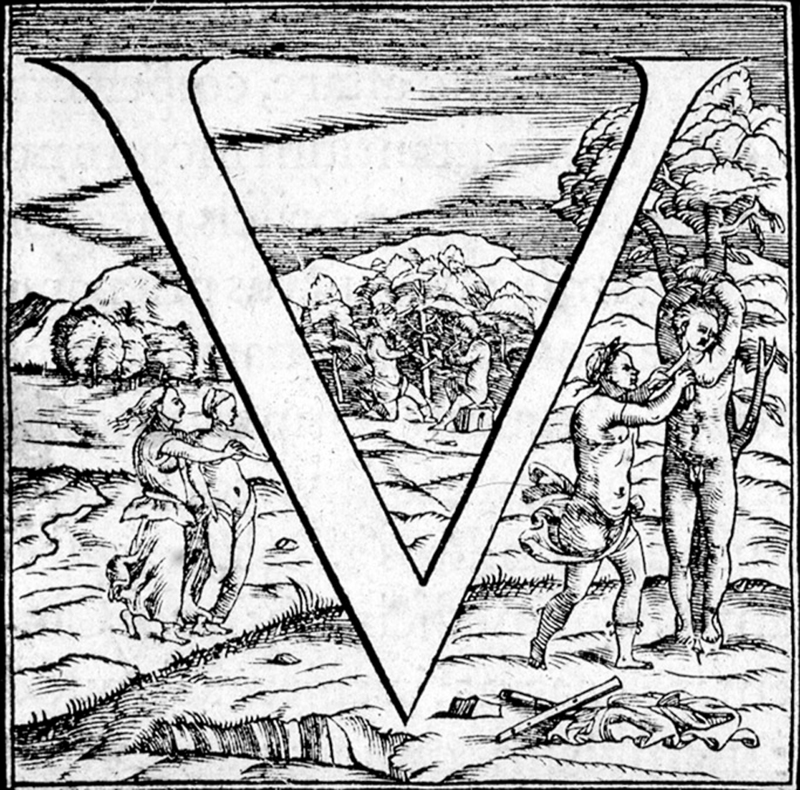 He also chose to begin the preface of this edition with a completely new and unique historiated initial, the letter V for Utunque; also, no doubt, V for Vesalius himself. As the first initial of the revised Fabrica Vesalius is clearly making a statement, although nowhere do we learn from him what that statement might be. 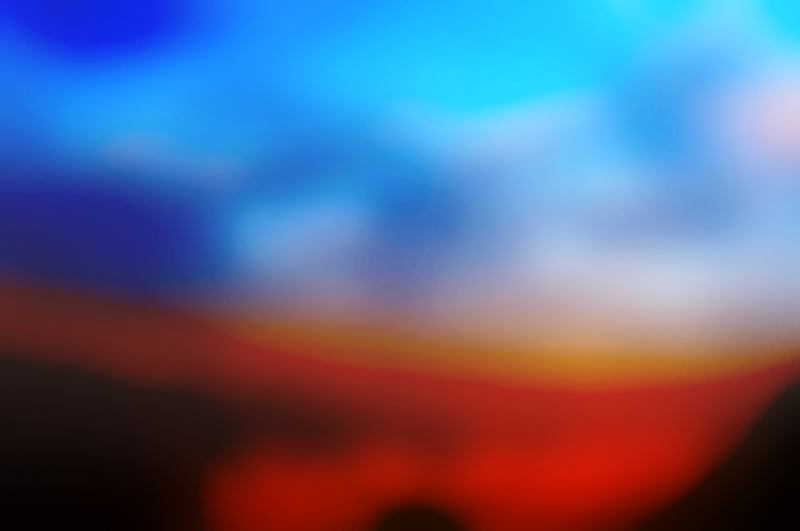 What does this new image represent and why did he choose it? 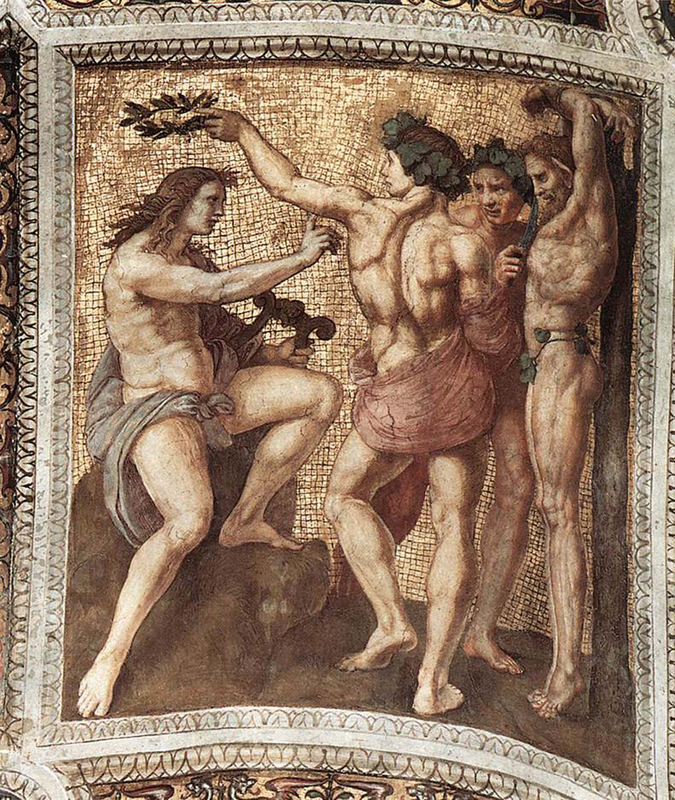 It tells the story of the ancient myth of Apollo and Marsyas. The Phrygian satyr Marsyas had become skillful at playing the flute and challenged the god Apollo to a musical duel. This was judged by the muses who declared Apollo, with the divine sound of his stringed lyre, the winner. As punishment for his impudence Apollo flayed Marsyas alive. This story appears to have captured the imagination of poets, emperors, popes, artists and now anatomists. It was first recorded in the fifth century BC by Herodotus, was re-told in Ovid’s Metamorphoses, and referred to in Dante’s Divine Comedy. This 15th century woodcut above provides us with a prologue to the myth. In the distance the goddess Athena is seen playing her flute to the gods on Olympus, who were said to have laughed at her. When later she sees her reflection in a stream with her cheeks puffed out as she plays, she curses the instrument and discards it. Marsyas finds it and teaches himself to play. Feeling invincible he challenges Apollo to the musical duel in which the muses judge him to be the loser. Apollo flays him alive and his skin is seen hanging in the distant temple. 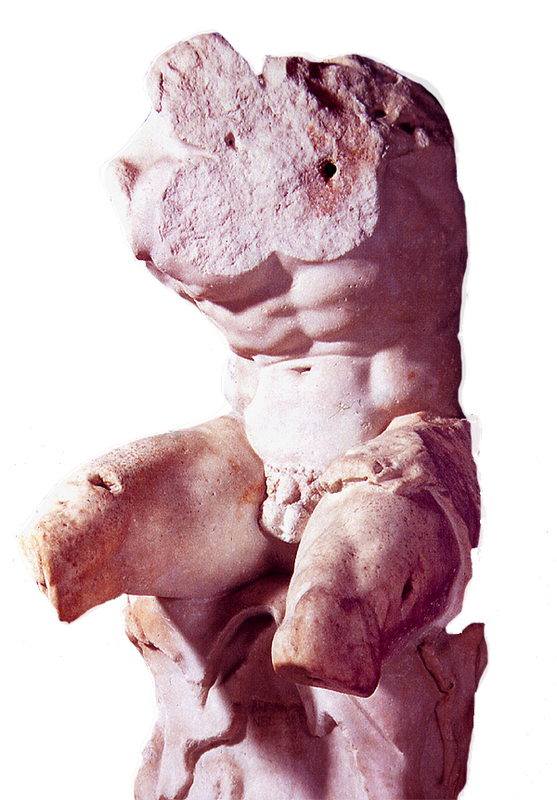 In antiquity statues of Marsyas were described on the Acropolis in Athens and later in the Roman Forum. The relief below is in the Athens Museum and shows Apollo with his lyre, the executioner his knife ready, and Marsyas playing the double pipe. On the right is a small marble from the Museum on the Greek Island of Kos, birthplace of Hippocrates, showing Marsyas hanging by his arms awaiting his fate. 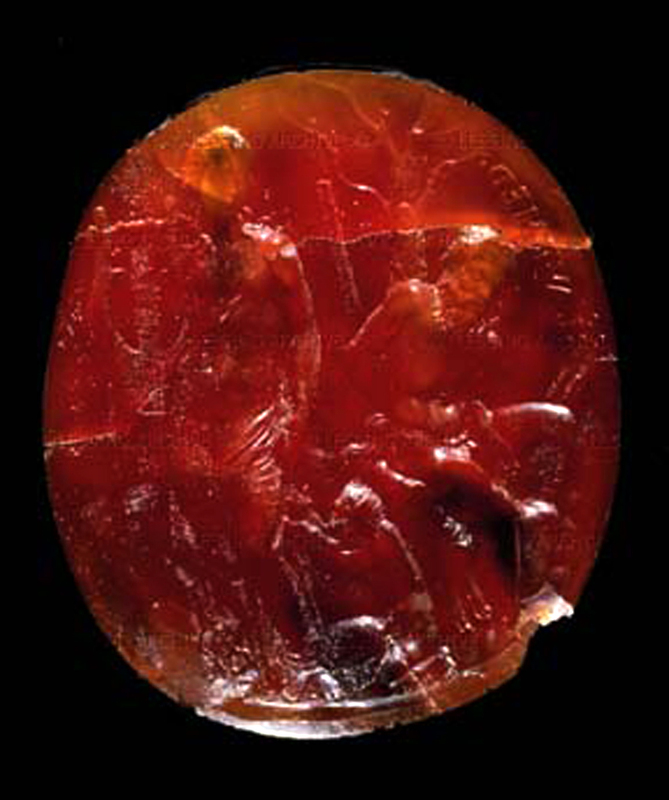 This beautiful carnelian gem was made for the Emperor Augustus and is now in the Museo Nazionale in Naples. In the 15th century it came into the possession of Lorenzo de Medici who made an impression from the gem that reveals its exquisite detail. 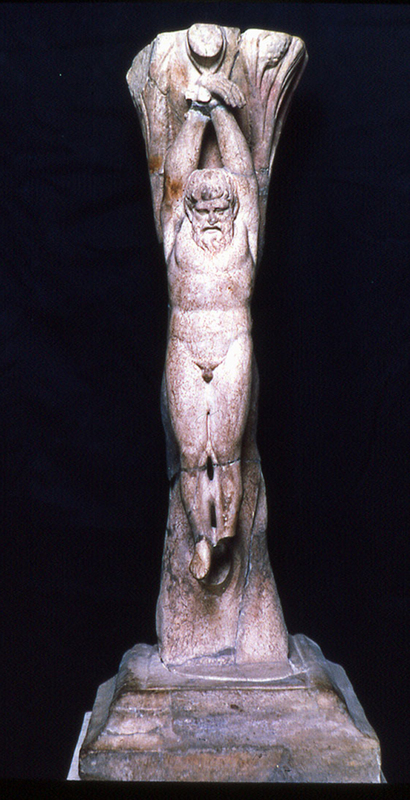 Marsyas, his arms bound is seated on a panther skin, the symbol of Dionysus, his pipes hanging from the tree behind him and the triumphant Apollo standing impassively with lyre in hand. It has been suggested that the Belvedere Torso in the Vatican, so much admired by Michelangelo, may well be a seated Marsyas. The figure is in the same pose as seen in the Augustan gem, and is similarly seated on a panther skin. 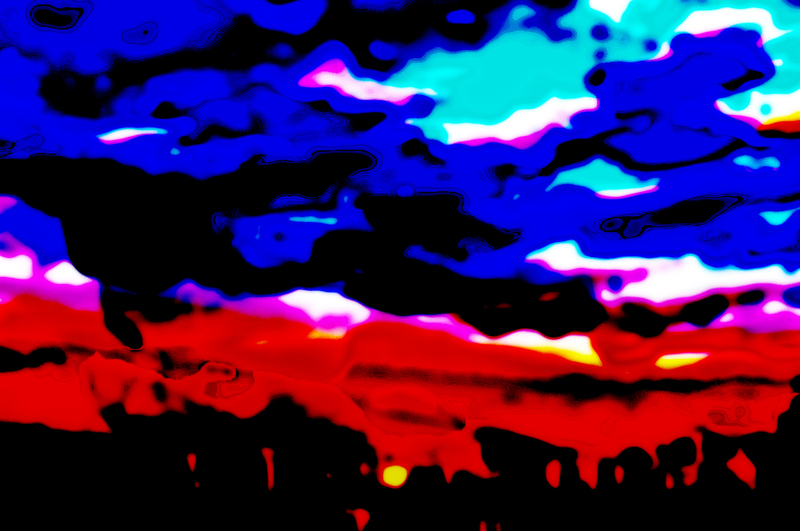 Many artists have been inspired to reproduce the myth. 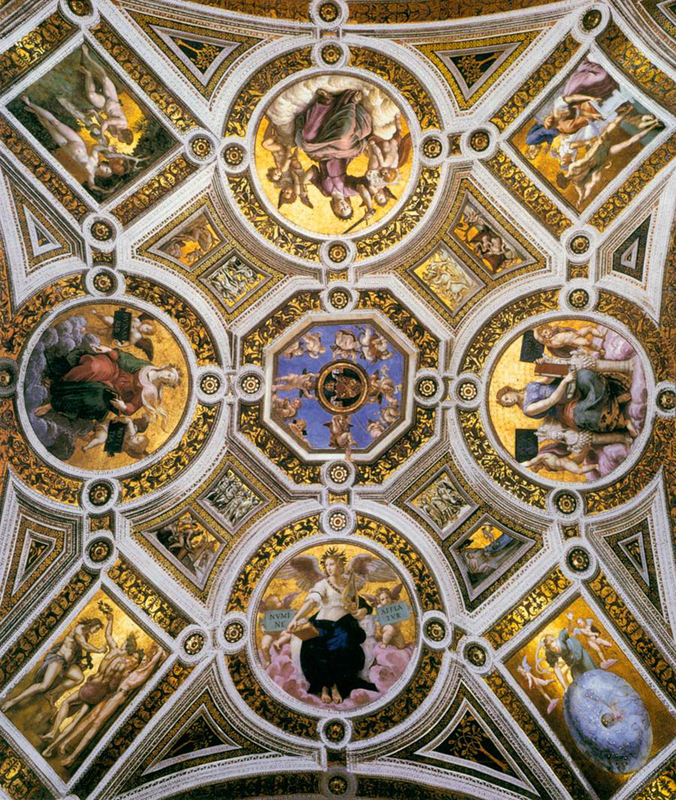 In the ceiling of the Stanza della Segnatura, in the Vatican, Raphael has placed it between representations of poetry and theology. The executioner, knife poised, awaits Apollo’s command to begin his work. 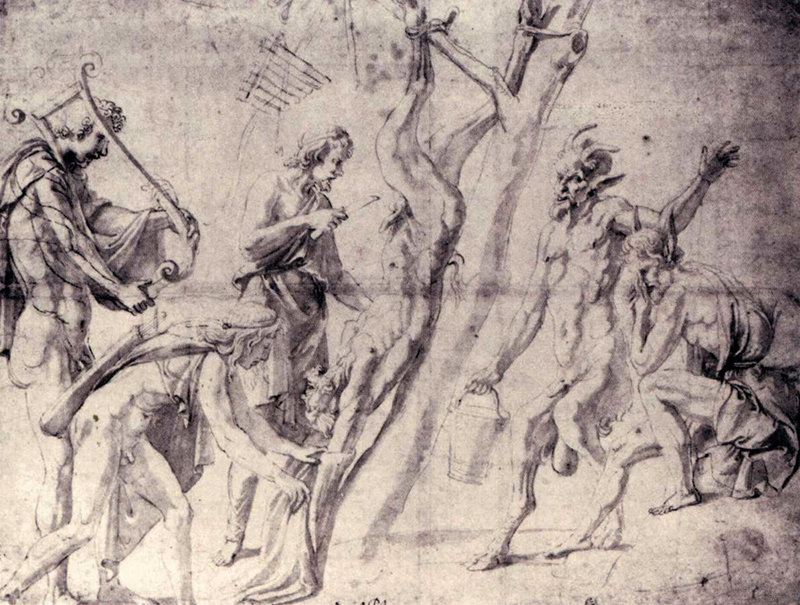 In this pen and ink wash from the Louvre in Paris by Giulio Romano in 1527 Marsyas has been suspended and his punishment is already underway. Romano’s image was perhaps the source of the last painting of Titian, the greatest Venetian artist of the sixteenth century. 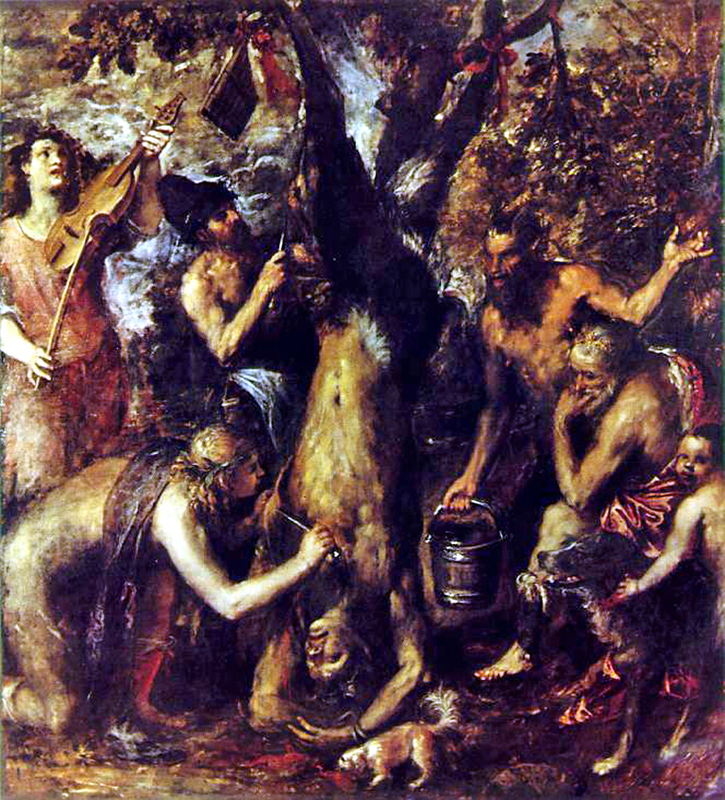 This painting of the Flaying of Marsyas was found in his studio after his death in 1576 and is perhaps the most moving representation of the myth, expressing life and death, harmony and discord, sacrifice and salvation. Which brings us back to Vesalius and the Fabrica. What were his intentions in representing the myth? Did he see himself as Apollo, or Marsyas, or perhaps both? He certainly had challenged fifteen hundred years of established Galenic anatomy, which was being taught in the universities of Europe. He had been publicly flayed in print by his old teacher Sylvius for doing so and had been described by him as a “mad deserter, wholly arrogant and wholly ignorant”. Yet Vesalius knew that his work was about absolute truth. 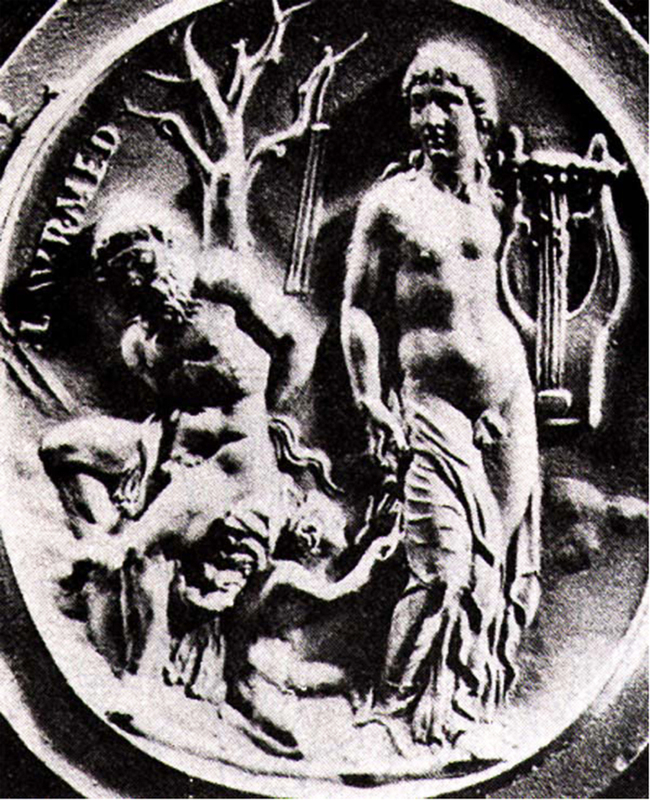 The harmony of the universe represented by the music of Apollo’s lyre is ever linked to the harmony and spirit residing in the human body. 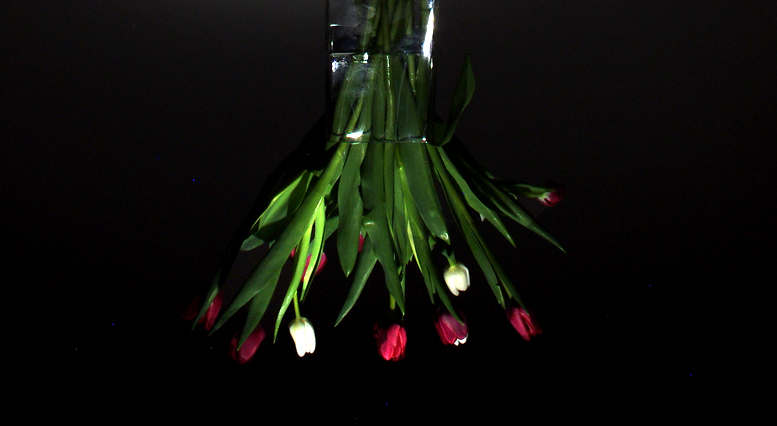 The beauty and strength of the flayed figures in the Fabrica express this belief. The skin may be gone but the body stands strong and tall; Marsyas lives. 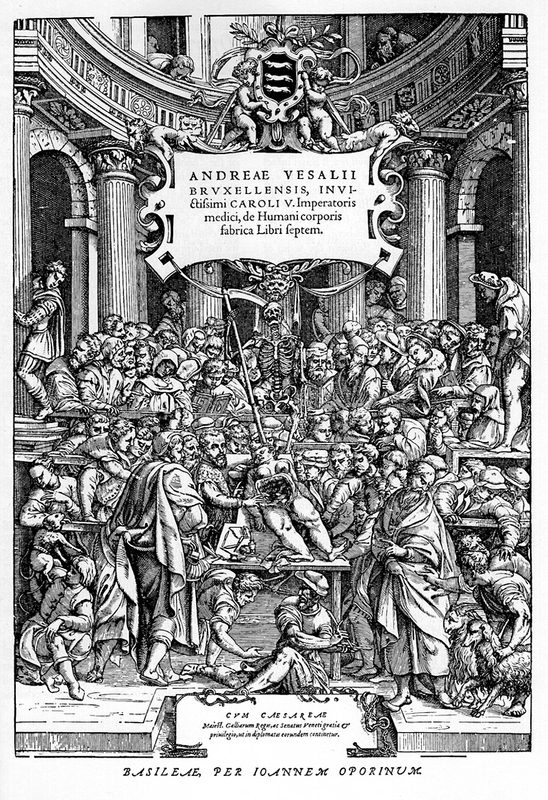 On this quincentenary of his birth it is Andreas Vesalius, the Apollo of all the teachers of anatomy, whom we remember today. His dedication to the teaching and writing of human anatomy became the foundation of modern medicine and surgery. We have much to thank him for. 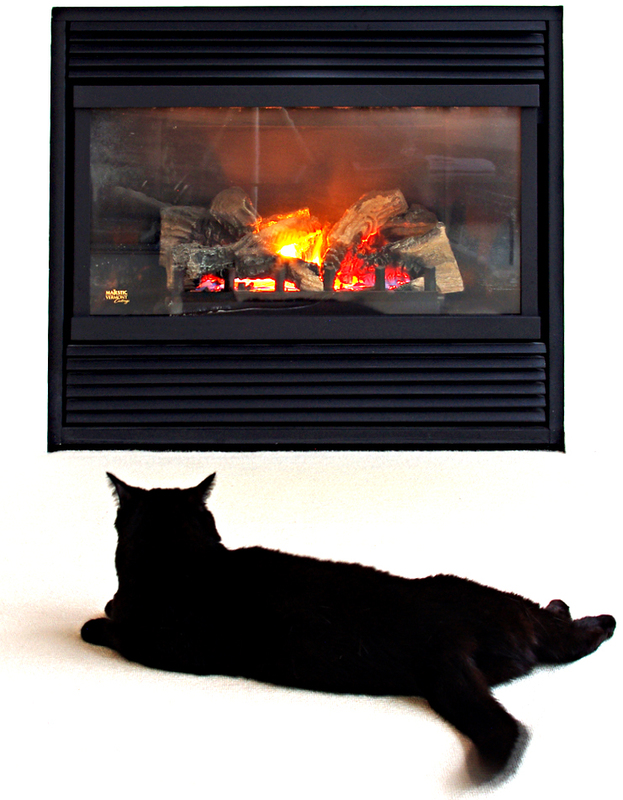 Although this picture of Sunday blissfully enjoying her favourite spot in front of the fireplace will be family to many of you from Photography 101, I felt it deserved a reappearance for this week’s Photo Challenge: Warmth. 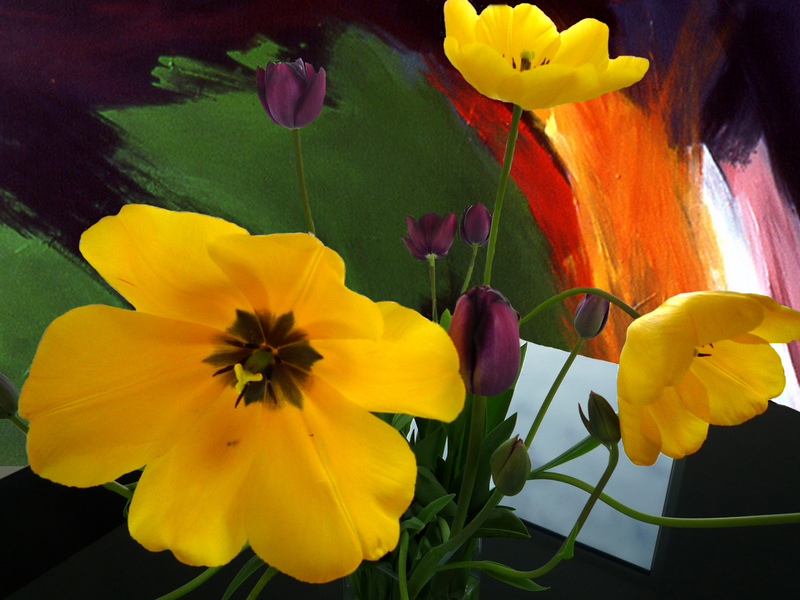 This has been an interesting four weeks experimenting with Photoshop Elements for Robyn’s One Four Challenge, as you can see. 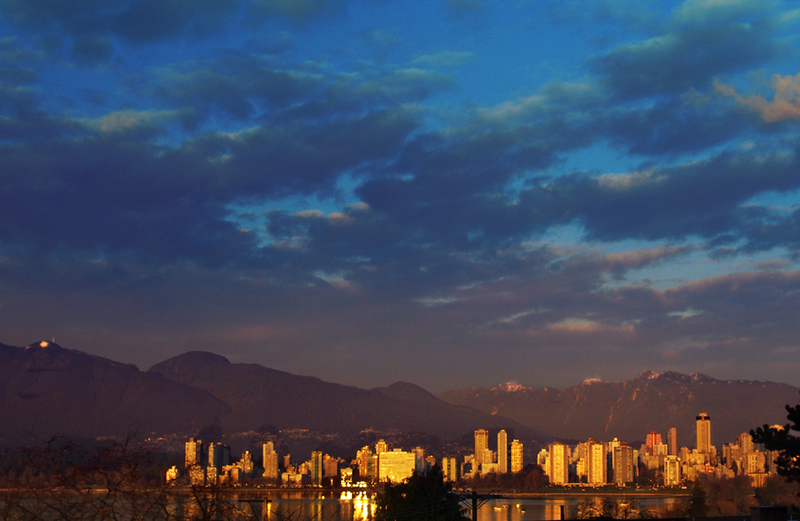 The original photo is of the skyline of Vancouver’s West End against the North Shore mountains as the sun was setting on December 1st. 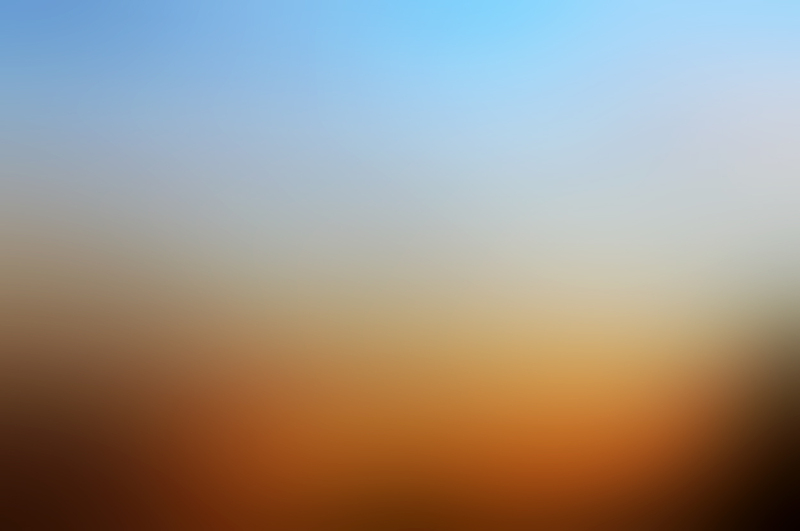 The first image was the result of pushing the Gaussian Blur to the limit with a surprising result. 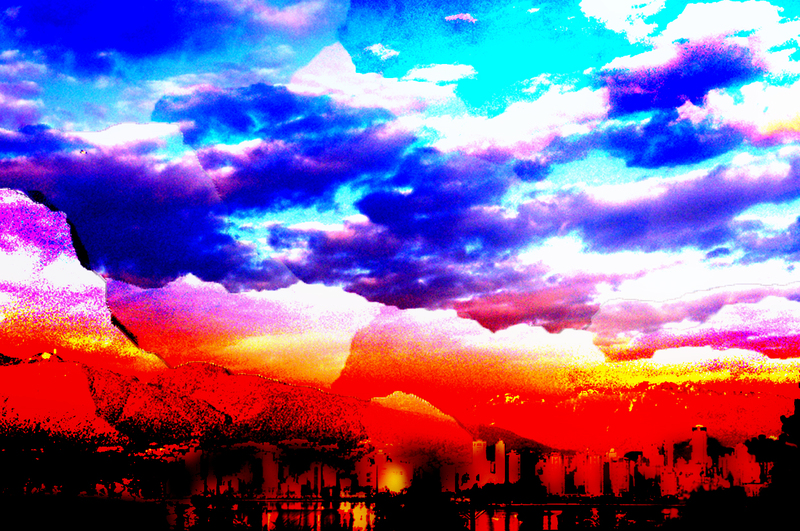 I then continued creating layers with differing degrees of colour saturation and lighting levels. 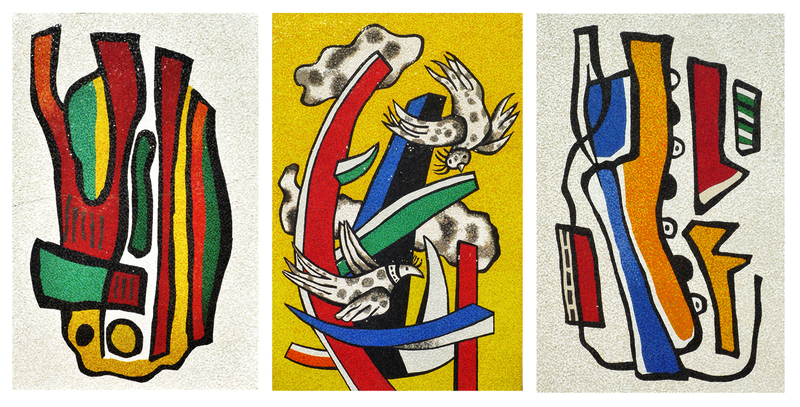 I could have used a number of variations but chose these four. It will be interesting to see your favourite if you contribute to the poll. 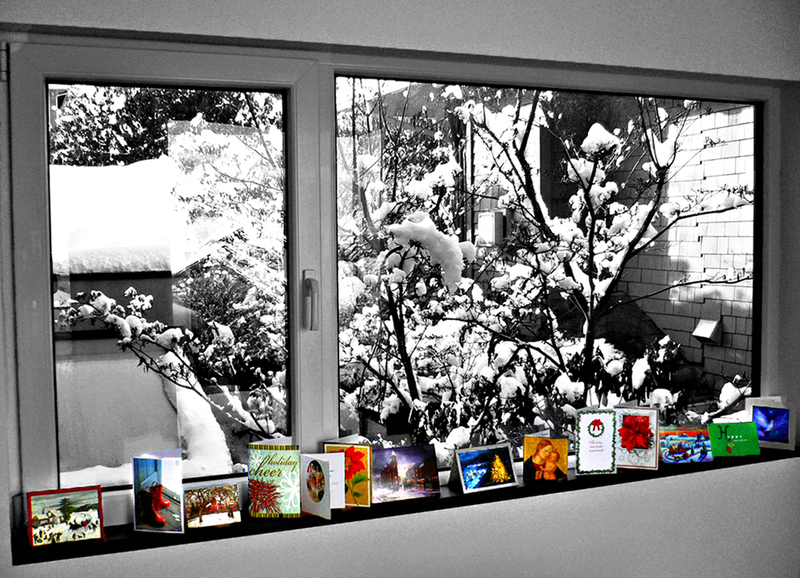 For this special Christmas Edition of Leanne Cole’s Monochrome Madness, the last of the year, we are all adding a splash of colour. 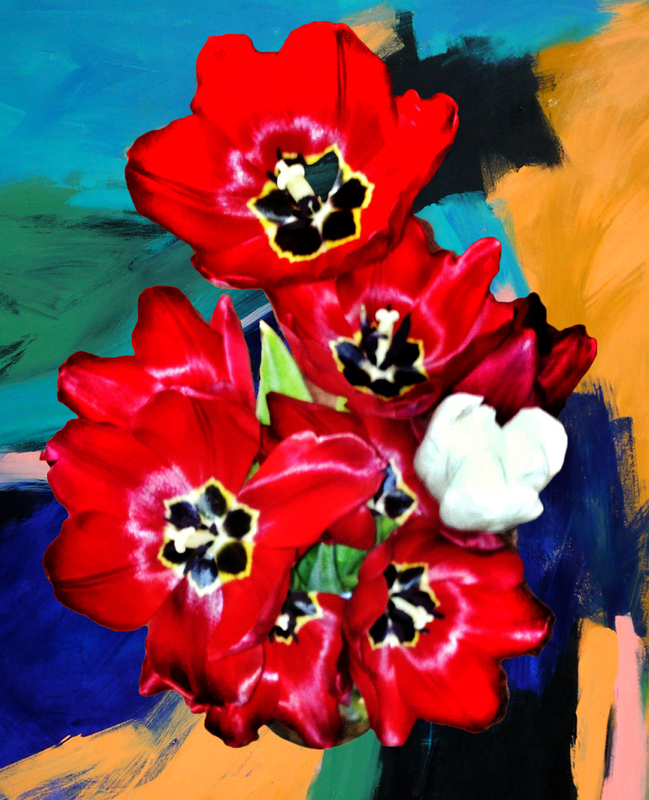 To see all the great submissions visit Leanne’s blog and enjoy a wonderful potpourri of great images, all with a touch of colour. 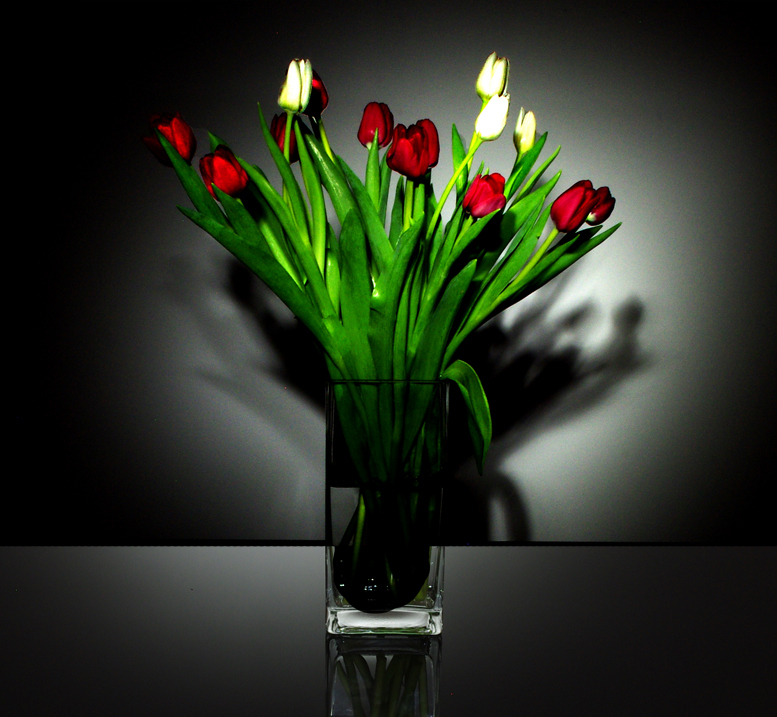 For Robyn’s One Four Challenge – 1 image 4 different ways over 4 weeks. 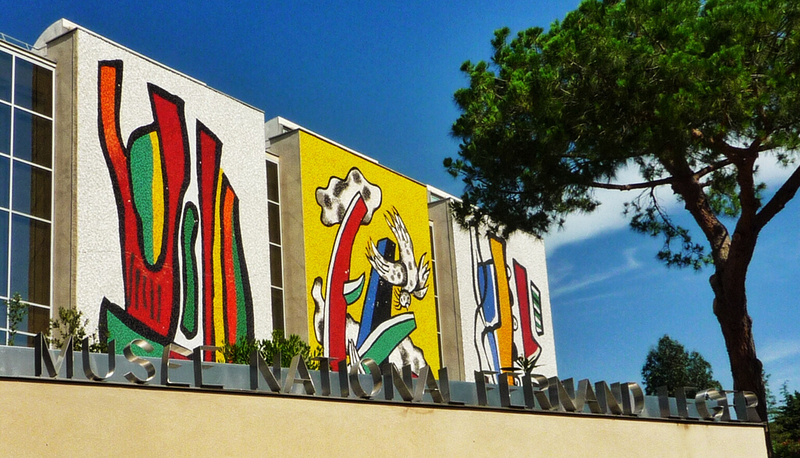 The brilliant yellows of the murals of the Musée National Fernand Léger, Ville de Biot in the South of France.